To take SC4's tutorial on the quickest and easiest way to find an online journal article in a database, click on "How to Find Articles Tutorial". Articles from academic and peer-reviewed journals are generally the most credible, relevant, and up-to-date sources for information since they are generally written by subject specialists, experts, and/or professionals in the field. Articles from magazines and newspapers, which are usually produced for the general public, are usually written by an editorial board or journalists, but they can still be useful sources for general information or for opinion articles. 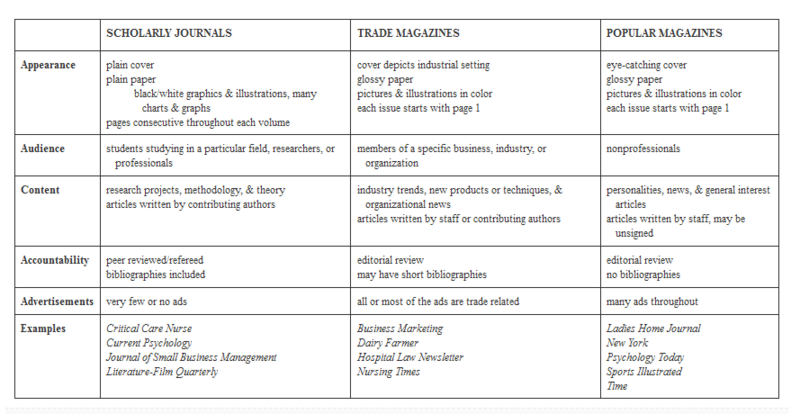 The chart below explores the differences between scholarly articles you'll find in the SC4 databases versus articles from general magazines and newspapers. 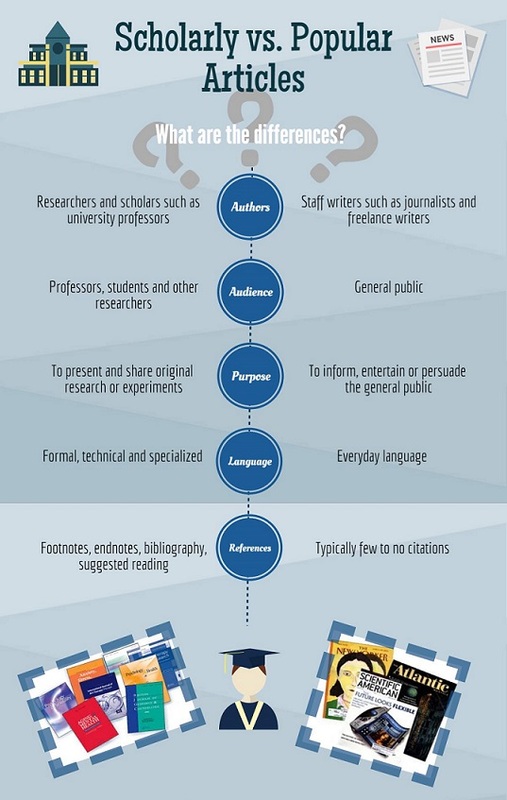 Image: "Scholarly vs Popular Articles." McMaster University, 2016, https://library.mcmaster.ca/sites/default/files/Scholarly%20vs%20Popular.jpeg. When searching SC4 Library online using the OneSearch option, you'll see the box below on the upper left side of the search screen. Underneath Refine Your Search, you can check the Scholarly & Peer Reviewed option or just the Peer-Reviewed option; both will return searches with academic-quality sources. You'll also notice the section that says Content Type under Refine Your Search, and by checking Journal Article, Magazine Article, etc. you can further refine the results of your search. Image: "IUPUI Department of Geography Library Guide." Indiana University, 27 Feb. 2018, iupui.campusguides.com/c.php?g=260362&p=2158510.